It’s the most wonderful time of the year … and also that time when holiday parties are prevalent in the workplace. These annual rites of passage have derailed many a career and a company or two. Over the next three weeks, I’ll be addressing some of the greatest legal challenges of the tradition. The natural starting point is the alcohol-infused holiday party. The legal drinking age is 21. Just because you invited your entire staff to the event, it doesn’t mean that the 20-year-old intern also can drink whatever he wants. If you, the employer, are controlling the pour, you must be very careful to only serve those of legal age. If you are out at a restaurant, you must remind all of your non-legal age employees ahead of time that they are not permitted to consume alcoholic beverages. Obviously, if you see them procure one during the event, you need to have it removed immediately. There is no reason to risk your livelihood because Jake wanted to try his first Johnnie Walker Blue. Never serve anyone already intoxicated. New York has what is called a “dram shop” act. (Back in the day, alcohol was served in units called “drams” – which is a Scottish term of art meaning, basically, any amount of whiskey a person could hold in one’s mouth; not a precise measurement.) Under this act, if you serve someone who is already impaired, you become liable for any damages to third parties that happen thereafter. For instance, if Frank from accounting is already slurring his words when he wanders up to the buffet table where the bottles of wine are, and you let him have more, you’re on the hook when Frank crashes into Ginny’s car. Or worse yet when Frank runs over little Joey down the block. Ginny and little Joey can sue you for contributing to Frank’s impairment. (Frank cannot sue you for his injuries, however.) Also under NY’s dram shop act, you are responsible for the actions of anyone you serve that you know to be a habitual over-indulger. So if Katie is known around the office for being uncontrolled around alcohol, if the stories of her weekends are legends, then you’re best off not serving Katie to begin with. Do I really have to say it – don’t drink and drive? This should be seared into every person’s conscience at this point. Drinking and driving isn’t just a legal problem, it’s a moral one. 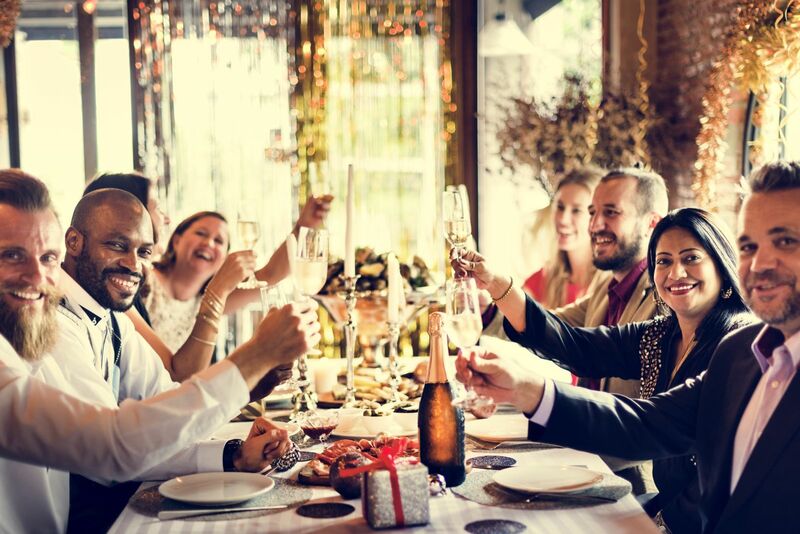 If you know you intend to have a great celebration and that the likelihood is high that your guests will be impaired (even a little), then do the right thing – organize rides home. One of my smart clients tells her guests, “party like a rock star!” and then reminds them that rock stars have chauffeurs. Have everyone get a ride to and from the party. Don’t risk anyone, especially some innocent bystander, for a good time. Make smart choices. For example, serve food at your event. I say this not just because I was fortunate enough to marry into an Italian family where having an event without food is anathema, but because food helps slow alcohol absorption. It also gives your guests something else to do besides focus on their next drink. Another smart choice is to have a cut-off time. When you attend a Yankees or Mets game, the seventh inning stretch is the cut-off time for buying alcohol. They want you to have some time to sit, relax and clear your head. Your party should be the same; stop serving alcohol an hour or so before the party ends. It should not end with your employees lined up at a bar pounding shots. That’s asking for a problem. Another good idea can be to stick to wine and beer and avoid the hard stuff. I think of the country song “Tequila makes her clothes fall off.” Some problems aren’t as prevalent when serving just chardonnay. And, finally, remind people to be smart before the party. Circulate a memo beforehand about how pleased you are to go out and celebrate, and remind them of the need to be responsible. Believe me, there are ways to phrase it so that it doesn't become a demotivator to your team. Holiday parties should be about spreading cheer. Following these four tips will help make you merry and bright.